The standard iconographic interpretation of the image icon is that the dragon represents both Satan (Rev. 12:3) and the Roman Empire. The feast of St. George is found in the Ethiopian, Coptic, Syriac, and Latin liturgies. The ancient “Georgia” is named after him. He is renowned as the armed defender of the Church, one who carried the trophies of victory over the enemy. Saint George (c. 275/281 – 23 April 303 AD) was a Greek who became an officer in the Roman army. His father was the Greek Gerondios from Cappadocia Asia Minor and his mother was from the city Lydda. Lydda was a Greek city in Palestine from the times of the conquest of Alexander the Great (333 BC). Saint George became an officer in the Roman army in the Guard of Diocletian. St. George is the patron saint of England. His cross forms the national flag of England, and features within the Union Flag of the United Kingdom, and other national flags containing the Union Flag, such as those of Australia and New Zealand. 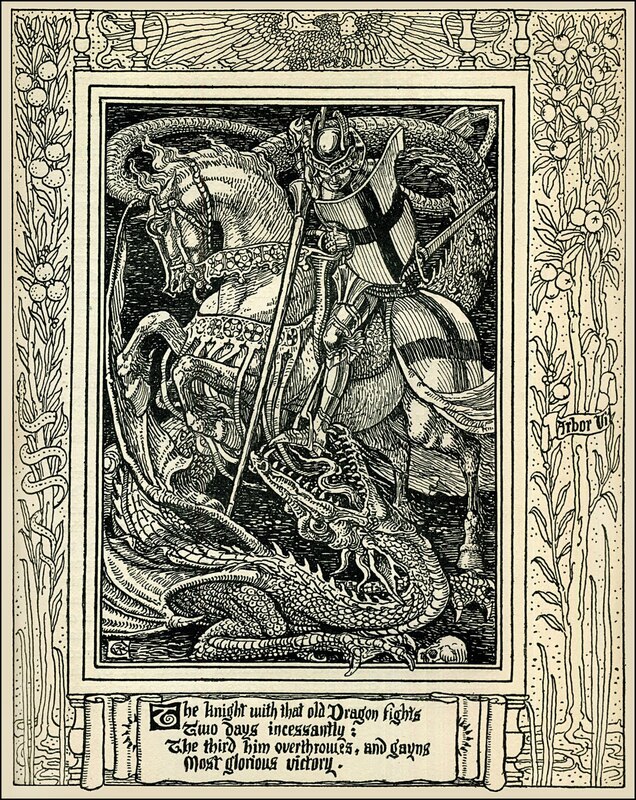 Traces of the cult of Saint George in England pre-date the Norman Conquest in the eleventh century; by the fourteenth century the saint had been declared both the patron saint and the protector of the royal family. Lesson from the Epistle of blessed Paul the Apostle to Timothy. Dearly beloved, be mindful that the Lord Jesus Christ is risen again from the dead, of the seed of David, according to my gospel. Wherein I labor even unto bands, as an evil-doer: but the word of God is not bound. Therefore I endure all things for the sake of the elect, that they may also obtain the salvation, which is in Christ Jesus, with heavenly glory. But thou hast fully known my doctrine, manner of life, purpose, faith, long-suffering, love, patience, persecutions, afflictions, such as came upon me at Antioch, at Iconium, and at Lystra; what persecutions I endured and out of them all the Lord delivered me. And all that will live godly in Jesus Christ shall suffer persecution.